Discussion in 'Other Disney Collectibles' started by starry_solo, Oct 9, 2017. I checked Ebay and U.S. prices have sold for less more often than for more than that in the past 3 months in the US, however, the lowest starting price on available dolls now is $150 USD. Since your not in the US, though, it's hard to say how available they are in your area. I don't think that's a bad price for the doll if she's still boxed w/ COA and you can afford it. It really isn't that much over retail. She's a lovely doll and reasonably you likely wouldn't get her much less in your area by what you said. Would it be worth it to you to wait to save a bit and risk not getting her, or pay a bit more if you can afford and have her now? Do you have the option to ask for the price to be reduced (even 10-20 may make it feel more certain to you)? You never know, it might be worth it to see if they'll knock it down a bit. If you do so, I just suggest not low balling and not asking an amount that would be insulting. Honestly, I'm fighting telling you to go for it, but I'm a bad person to ask. I love these dolls, and doll collecting in general, so I'm willing to spend too much if I really want a doll and it doesn't come around too often. It would be worth it for me to spend a bit more to have the doll in hand if I'd been wanting her for a while. So bottom line, you know yourself and your situation best. If it'll make you happy and not hurt you financially, it's worth it in my opinion. Also, think of your time as money. To get a better deal, you're going to have to spend a lot of time researching and stalking the secondhand market. I think I’m definitely going to go for it. I’ve been checking eBay prices for months, maybe years now and it’s the best price I’ve seen. And condition. I asked the seller if she’d go any lower and she said £150 was the lowest, which I don’t mind paying since I had the money for my birthday so it won’t hurt me financially. I think I just wanted to double check if anyone wise thought the doll was a good price as I’ve only ever brought Pocahontas 17” at retail in store. So this is my first time buying on the second market. Thank you both for your reply and advice - much appreciated! LMB925 and Meritre like this. My beautiful blue dress Aurora arrived today and I couldn’t be happier! First time buying a doll from eBay as I was lucky to get my beloved first LE Pocahontas doll from in store. And I’d say my first experience buying off second market was a succes! The seller packaged her in two boxes (one of the boxes was her original shipping box) with lots of bubble wrap and extra padding so she was very secure. I even had trouble getting her out the boxes because of how secure she was! You honestly wouldn’t think the doll was pre-owned as she looks brand new! I can’t remember her exact COA number as I was too excited to display her next to Poca but she is in the 3,000 out of 4,000. I’m very happy to now own my dream dolls. 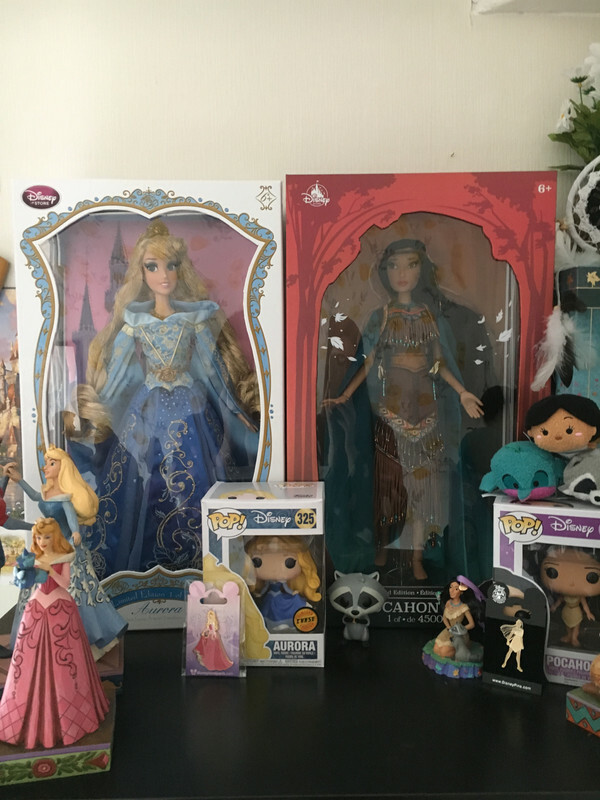 That is until they make an Esmeralda and Kida LE doll - I tried to add a photo but each time I did, they didn’t upload. Can someone kindly tell me how to upload photos again as I’ve forgot. None! You should be able to post them regardless, as far as I'm aware. It's just tricky because you have to link to the picture. So you need a url. You can use free online image hosting sites like postimage.org that don't require you to make an account. Then just copy the link into the image prompt box and you'll have a picture. you can do what I think I saw @bookhugger suggest in another post, which is what I do. Send it to a Facebook friend, open the image, then right click, copy & paste. Or upload to imgur, right click on the image, copy & paste. starry_solo, LMB925, pretty Omi and 2 others like this. Your new doll is beautiful! and the rest of your collection looks great as well! Thank you so much! I’ll probably rearrange at some point but she makes the perfect new addition. My FB group had heard rumors of there being a LE for Clara from the new Nutcracker? Any evidence to that being true or false, or were they actually referring to the Barbie Signature Collection doll Disney released? There is talk about a 17” Mary Poppins. She's pretty, but I seriously wish we'd gotten a Clara instead. JMO though. That makes sense from a business side. The film itself looks like a trashfire (I personally haven't seen it yet, not sure if I plan to but I have Nutcracker enthusiasts in the family lol so I may) and like another rehash of Tim Burton's Alice which I also wasn't a fan of. However, I looove Clara's purple dress or even her little soldier outfit and I'd love to have an LA doll of either outfit. I'd love to see Misty Copeland in doll form, but it looks like we definitely won't. Corret me if I'm wrong (and I haven't seen the film), isn't Misty Copeland already featured as a Nutcracker doll via the Barbie line? Because the one wearing the white ballet outfit looks nearly like her. Agreeing that it would've been fantastic if there had been LE dolls directly from Disney, guess they're holding back after Alice and Wrinkle. I haven't seen the film but I want to. Being a Nutcracker and James Newton Howard fan. Disney is selling Sugar Plum, Clara, and the Ballerina (Misty Copeland) from the Barbie Signature collection, yes. Sugar Plum and the Ballerina are beautiful while Clara is just kinda meh. They could have put much more effort into hers than they did, which really disappoints me. Oooh nice...I'd jump on a Julie Andrews version. Is anyone here going to be trying for Mary Poppins on Saturday in store? As with Jack and Sally there seems to be little to no buzz about this doll. Not that that is a bad thing id love an easy release like Jack and Sally(when we got to the store for them the manager had forgotten they were released that day) and we were the only people in line. My store still has one more Jack and one more Sally. If anyone is going to be at the Burlington Ma store I will be there.